For the L'Atelier de Paris, or any Edwardian era dress shop! 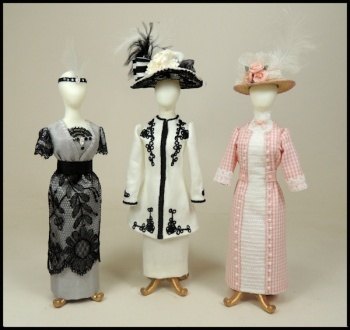 I have created three wonderful dressed mannequins that are costumed in authentic styles for the period. I've been inspired by my all time favorite mini series.... if you are fan, you'll recognize the names and some of the style elements. We have an ensemble for travel, garden party, and evening. 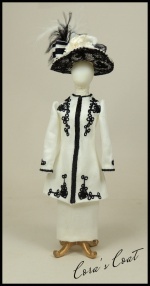 Cora's coat is inspired by a beautiful Edwardian suit with wonderful soutache' braid decoration. I could not begin to replicate the design with cording, as everything I tried was too thick. So I digitized the design and machine embroidered it directly to the fabric. This turns what would be a nearly impossible task into a very easy to create and stunning ensemble. The matching hat is embellished with antique lace, silk ribbons, netting and mulberry paper flowers. 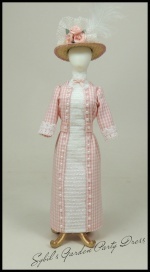 Sybil's Garden Party Dress is made from a darling micro check cotton in a soft peachy pink. The fabric was actually called "pink lemonade". The center panel has been machine embroidered to represent tiny tucks. Oodles of little pearl buttons march down either side of the center front panel. The straw hat is trimmed with silk netting, and silk ribbon roses. Lady Mary's evening gown is a style that was extremely popular in the late Edwardian era. 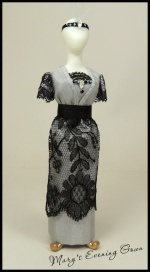 It is made from beautiful shimmering silver silk, and topped with a spider web thin layer of black antique lace. Vintage Swarovski crystals trim the dress and darling feathered hatband. These projects require almost no sewing. Just hand gathering where needed. All seams are glued, and the construction is easy. Because I have a limited quantity of the antique black laces, Lady Mary's dress is available only in the set of three mannequins. However, if you do not want or need three mannequins, Sybil's Garden Party and Cora's Coat are also available as separate kits. You do save $25.00 when you purchase the 3 piece set. I'm currently searching for another piece of antique lace that would be a suitable replacement, but until I find one, this class is limited - first come first served. These kits will ship at the end of April. Everything is included, mannequins, fabrics, laces, trims, ribbons, embellishments, and an extensive tutorial. Students will need to supply paint, scissors, needle and threads, glue and tweezers. If you have any questions, drop me an email!